Hatteras Moon is a stunning oceanfront in a class by itself. 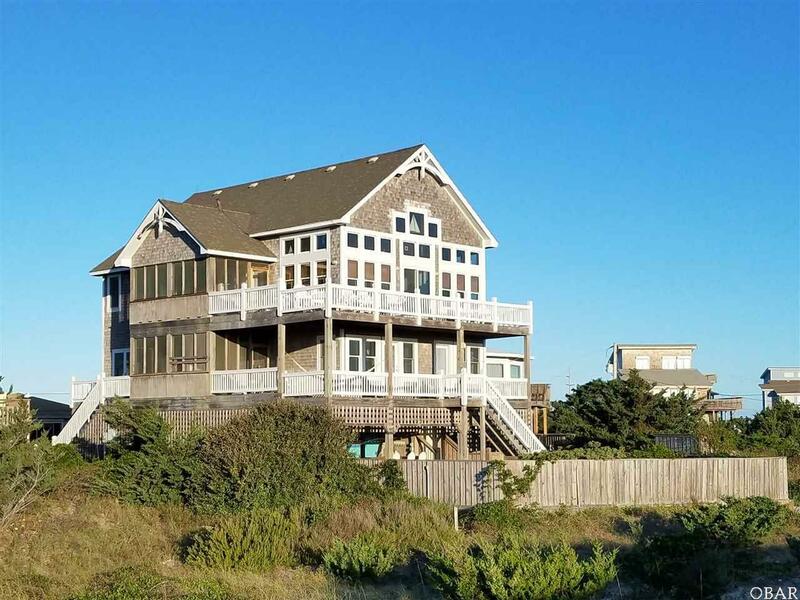 Located in popular North Avon with beautiful wide beaches and great dunes, the views are endless. This beautifully furnished 5 bedroom custom built home is designed for ultimate family vacation enjoyment. The great room features cathedral ceilings surrounded by windows to take in the views. Any gourmet will appreciate the kitchen with granite counters and stainless appliances. Overlooking the great room is the top level game room with pool table, foosball, comfortable TV viewing area and sound to ocean views! The screened porch off the kitchen and media room/den is above a second screened porch with hot tub and access to the sauna. The private pool with newly updated Tiki Bar is set up for ultimate family and friend gatherings. The landscaped garden path as you approach this special home invites you to check out this ultimate beach home for yourself. Listing courtesy of Rita Dwight of Surf Or Sound Realty - Avon.